Republic of Macedonia (FYROM) is an inland country located in the central part of the Balkans with an area of 25,713 km2 and a population of 2,058,539, with an average of 80.01 residents/ km2 (as of 2011). Despite of its small surface size it has diverse landscape and different habitat types. Mountain and semi-mountain areas comprise around 80% of the national territory: 30% of the Macedonian population live in 1,028 communities in those areas. 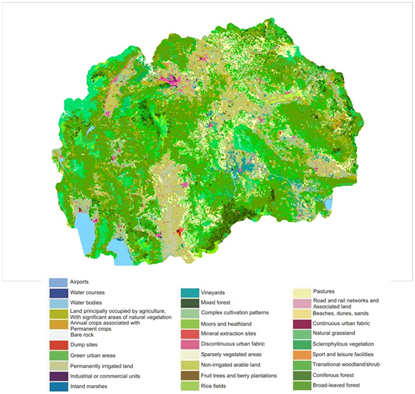 According to CORINE land cover classification, land uses consists in 59.8% forests, followed by 36.9% agricultural areas , 2.2% water bodies, 1.6% artificial areas and 0.1% wetlands (State statistical office of the Republic of Macedonia, 2014). Increased urbanization in Macedonia (FYROM) presents nowadays challenging environmental pressures on the ecosystems in terms of land degradation and soil erosion. In particular, the urbanization of large towns and cities comes with high conflicting purposes of land use (e.g. infrastructure, housing compared with forestry and agriculture), whereas increasing number of smaller rural areas are facing with de-population and abandonment (Mitkovska and Cvetkovska, 2006). Other main environmental problems include, loss of biodiversity and ecosystem services, especially regulating services (air and water pollution). Hence efforts in both academic and policy arena are needed to show the potential value of the natural resources, also allocating adequate resources for their management. One of the potential approaches for emphasize such values is by using ecosystem services assessment. Ecosystem services are the benefits human obtain both directly or indirectly from the ecosystems (Millennium Ecosystem Assessment, MEA 2005). MEA provided initial nomenclature and classification standards and grouped different ecosystem services into four major categories: 1) supporting services (e.g., nutrient cycling, soil formation and primary production), 2) provisioning services (e.g., food, fresh water, wood and fiber and fuel), 3) regulating services (e.g., climate regulation, flood and disease regulation and water purification), and 4) cultural services (aesthetic, spiritual, educational and recreational services). Following the MEA, several international initiatives, including The Economics of Ecosystems and Biodiversity (TEEB) and Wealth Accounting and the Valuation of Ecosystem Services (WAVES), were launched to investigate the global economic benefits derived from ecosystems, ecosystem services and biodiversity. Some studies have already explored the potential of using ecosystem services mapping as an assessment tool: for example, Avramoski (2013) identified and mapped eight ecosystem types with their key ES generated in the transboundary Prespa basin. Other studies addressed the economic values of ecosystem services: for instance, Ceroni implemented the ES framework to estimate the value generated each year in the Ezerani Natural Park (Ceroni, 2013). According to this study, the annual economic values of the ES (mainly provisioning and cultural services) at the Park in its present state amounted 286,271€, compared to the annual costs of management (maintenance and operation costs),which amounted 26,687 €. These findings are also the evidence of the potentially wide range of implementations that the ES framework could have: i) for analysis of the present state of the stock and flows of the ecosystem services, ii) for socio-economic and ecological assessment and valuation of the categories of the ecosystem services for the purposes of cost-benefit analysis of particular policy, iii) as communication tool for regional planning and participatory management of natural resources. Create a platform for exchanging knowledge and ideas on how to best implement the ES concept in the research studies, policies or management of natural areas in Macedonia and abroad. Mainstreaming the concept of ecosystem services (ES) in sustainable development projects, among academic institutions, organizations and general public. Avramoski O. (2013) The system “Prespa lakes – Ohrid lake”: The actual state – problems and perspective, organized by the Macedonian Academy of Sciences and Arts Academy of Sciences of Albania, Struga (Macedonia) – Pogradec (Albania). Ceroni M. (2013) Breaking new grounds in conservation in the Republic of Macedonia: The economic case for long-term protection of the Ezerani Nature Park. 53 pages. MEA (2005) Millennium Ecosystem Assessment: Ecosystems and Human Well-being: Synthesis. Island Press, Washington, DC. Mitkova, T., Cvetkovska, M. (2006) Presentation on: Overview of soil information and soil protection policies in Republic of Macedonia, Ministry of the Environment and Physical Planning State statistical office of the Republic of Macedonia (2014) Environmental statistics. Skopje, 167 pages.